Bella Terra WInery has a professional regulation size Bocce Ball court. The court is open for the public 7 days a week. Through out the year Bella Terra Winery will be holding Bocce Ball Tournaments. VIEWING OF TOURNAMENT AND ENJOYING THE LIVE BAND FREE FOR EVERY ONE! Bocce is a precision sport closely related to bowls and petanque with a common ancestry from ancient games played in the Roman Empire Developed into its present form in Italy it is played around Europe and also in overseas countries that have received Italian migrants, including the United States,Canada,Ausralia,Brazil and Argentina (where it is known as bochas), initially amongst the migrants themselves but slowly becoming more popular with their descendants and the wider community. In parts of the U.S. Croatian immigrants brought 'Bocce' to the U.S. In some instances, 'half-sized' Bocce courts were built because of land/lot size constraints. Bocce is played on dirt courts approximately 20 to 30 metres in length and 2.5 to 4 metres wide, sometimes with wooden boards of approximately 15 centimetres in height surrounding the court. 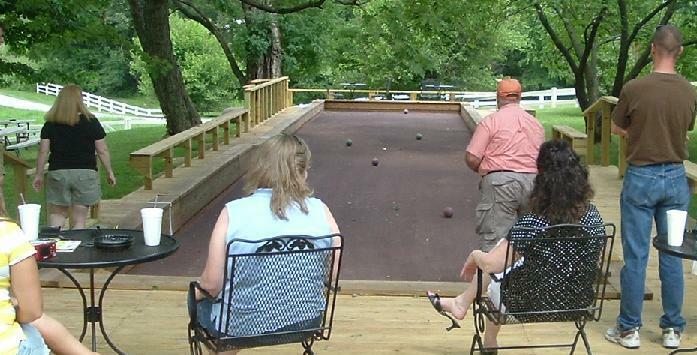 Bocce balls can be made of bronze or various kinds of plastic. Unlike lawn bowls, bocce balls are spherical and have no inbuilt bias. A game can be contested between two players, or two teams of two or four. A match is started by a randomly chosen side being given the opportunity to throw a smaller ball, the jack (called a pallino or boccino in some areas), from one end of the court into a zone about 5 metres in length, ending 2 metres from the far end of the court. If they miss twice, the other team is awarded the opportunity to roll the pallino anywhere they choose within the prescribed zone. If neither team is able to roll the pallino into play as prescribed in the rules, then the pallino is placed on a spot that is marked on the court. At this time the team that attempted to put the pallino into play first gets to roll the first ball. The side that places the jack is given the opportunity to bowl first. Once the first bowl has taken place, the other side has the opportunity to bowl. From then on, the side which does not have the ball closest to the jack has a chance to bowl, up until one side or the other has used their four balls. At that point, the other side bowls its remaining bocce balls. Like lawn bowls, the team with the closest ball or balls to the jack is awarded one point for each ball that is closer to the jack than the other side's closest ball. The contest continues until one team scores 13 points (though this can vary regionally). Players are permitted to throw the ball in the air using an underarm action. This is generally used to knock either the jack or another ball into a more favourable position. Tactics can get quite complex when players have sufficient control over the bocce ball to land or roll it accurately.